String players currently studying in my hometown Szeged, premiered a piece from my Book of Sonatas for Viols. The string trio version of Sonata segunda was played by Kleopátra Tulpán, Gergely Kálmán and Dóra Károlyi on 13th March, in the final concert of the Second Festival of Young Composers, Szeged. An extraordinary programme featuring pieces for gamelan and other kinds of percussive instruments, objects, piano and electronics written by composers of centriFUGA. As part of the concert, my piece Colonial Times – 19 Small Islands near West Java will be premiered by the members of Surya Kencana A, János Nevelő, Dzsanda Vitalij, András Térfy, and myself. The concert is an event of Transparent Sound New Music Festival. Date, location: Sunday 13-01-2019, 19:00, FUGA Budapest Center of Architecture, Budapest. 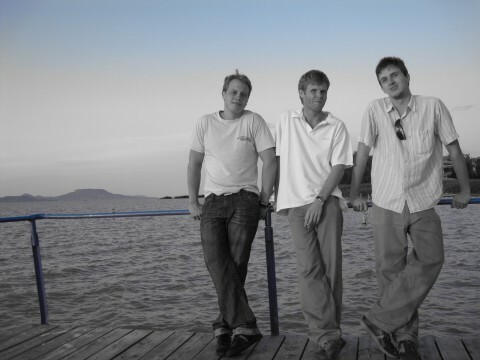 The Classicus Quartet has launched an epic series of concerts: each event of their project features pieces based on one particular note of the chromatic scale from C to B. 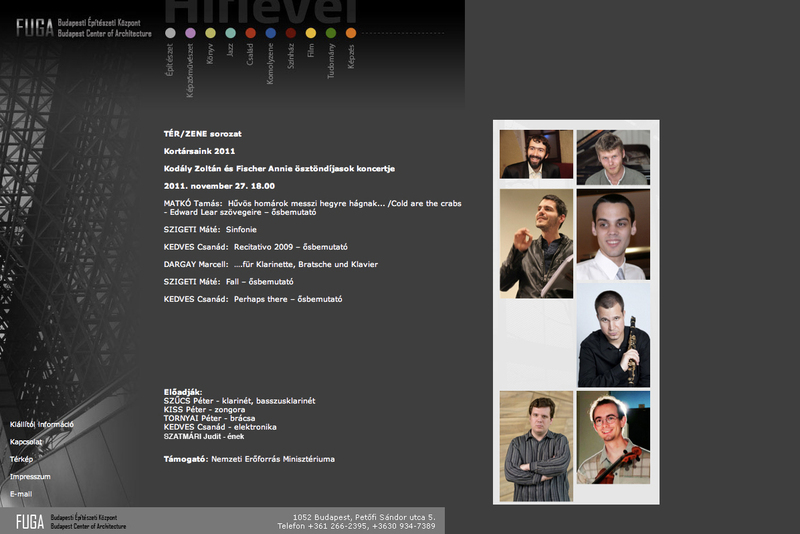 The twelve-part series will be extended by 4 more ‘intermezzo-concerts’. (See more details in the webpage of Classicus Ensemble). My piece Second Movement (Beethoven) which is also part of my work Late Quartet will be played in the second concert, along with string quartets by Mozart, Schubert and Shostakovitch, all based on the note ‘C’. Date, location: Saturday 28-04-2018, 18:00, BMC Main Hall, Budapest. A fine selection of the most recent pieces for cimbalom written by Hungarian composers, featuring my new work Nuevas diferencias sobre el canto ‘Con qué la lavaré’ dedicated for cimbalom player and good friend András Szalai. Other composers in the programme: Máté Balogh, Gyula Csapó, Csanád Kedves, Tamás Matkó, László Sáry, Zsolt Serei, and Péter Tornyai. Date, location: Sunday 25-03-2018, 18:00, FUGA Budapest Center of Architecture, Budapest. A neo-baroque cantata based on a speech by MP Zoltán Balog. The text is about culture, funding, healthcare, education, and lamb stewing. The piece will be performed twice in the same week. Public rehearsal: Monday, 18-09-2017, 18:00, Gólya, Budapest. Premiere: Wednesday, 20-09-2017, 19:00, Bálint Sándor Művelődési Ház, Szeged. 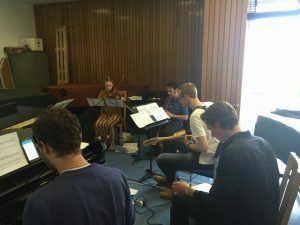 As part of the inaugural concert of our new-music ensemble Ensemble Out-Take, two pieces of mine will be played at a local pub in Southampton. A rare occasion to enjoy beverages and experimental music at the same time. Other featured composers are Laurence Crane, Christian Wolff, Millie Aldridge, and Christian Drew. Date, location: Monday, 06-03-2017, 20:00-21:30, Talking Heads, Southampton. I will be attending some of the concerts of the fantastic Canadian string quartet on their European tour, including the Hungarian premier of Gyula Csapó’s Déja? Kojá?, and a lecture-recital in Aberdeen. I will also have the opportunity to work on my recent piece Late Quartet with the musicians on a public workshop. 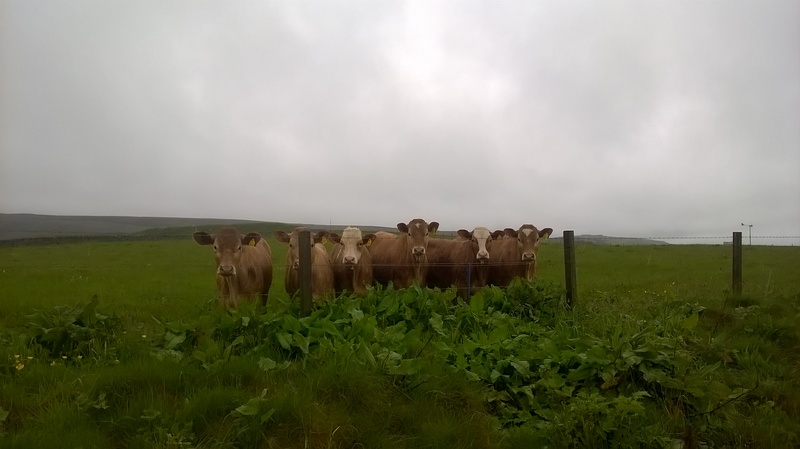 The piece is a representative conclusion of my research on musical borrowing. Date, location: Saturday, 29-10-2016, 10:00-17:00, The Anatomy Rooms, Aberdeen. Mylied, a piece of mine for piano solo will be premiered by György Klebniczki on a concert featuring composers related to my birth town. Date, location: Tuesday, 11-10-2016, 19:00, Bálint Sándor Művelődési Ház, Szeged. Not long after its premier, my piece Liederbuch is on concert again, this time with brand new people and venue. The programme offers an extremely diverse selection of pieces from renaissance songs to electronic improvisation. Liederbuch is going to be played by Dávid Kanyó (alto flute), Ábel Fazekas (bass clarinet), Beáta Móri (cimbalom), and Zsolt Sági (gitár). My piece Elude (a truncated Satie-prelude) will be played by Ensemble Dissous on a concert celebrating Satie’s 150th birthday in Edinburgh. Since I have not updated the News for a year, instead of advertising future concerts, I am going to write an annual report about the most important events of 2015. After I got back from Scotland, I had the good fortune to work with Norwegian percussionist Håkon Stene, on my piece, Niemandsland for vibraphone and objects, on a workshop at Turner Sims Hall, Southampton featuring other composers from the Department. The series of workshops ended with the ensemble Plus Minus this year. My recent piece In the Lovers’ Orchard written for 3-6 freely chosen instruments and piano, was played on clarinet, violin, electric guitar, and piano on the workshop held at Turner Sims Hall on 2nd November. An eventful weekend with talks, public rehearsals, a composition workshop, and most of all: the UK premiere of Michael Finnissy’s large-scale work Remembrance Day for soloists, choir and orchestra. On Saturday morning, the Exaudi vocal ensemble will be performing pieces written by Southampton composers. Among these, my piece Place me on Sunium’s marbled steep is going to be sung. 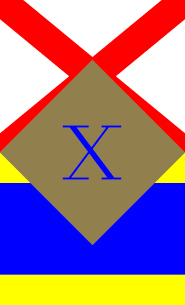 Date and location of the Exaudi workshop: Saturday, 15-11-2014, 10:00-12:00, Turner Sims Concert Hall, Southampton. Full programme for the weekend here. My piece Sonatensatz will be on programme again, in Budapest. 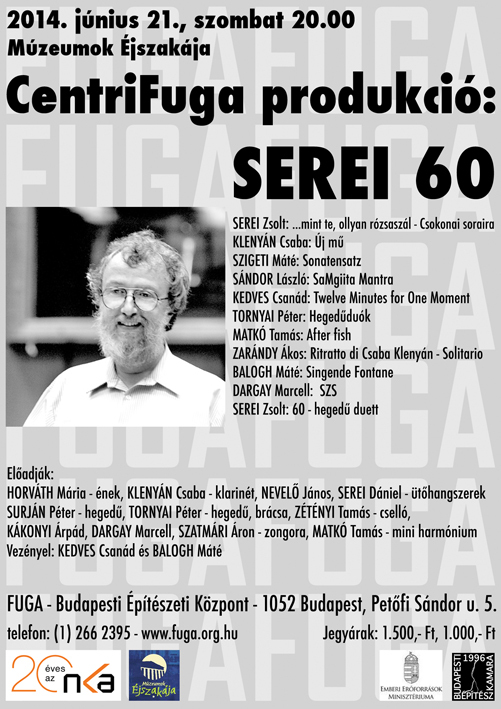 The concert is dedicated to Zsolt Serei’s 60th birthday, and involves pieces by Máté Balogh, Marcell Dargay, Csanád Kedves, Csaba Klenyán, Tamás Matkó, László Sándor, Zsolt Serei, Péter Tornyai and Ákos Zarándy. 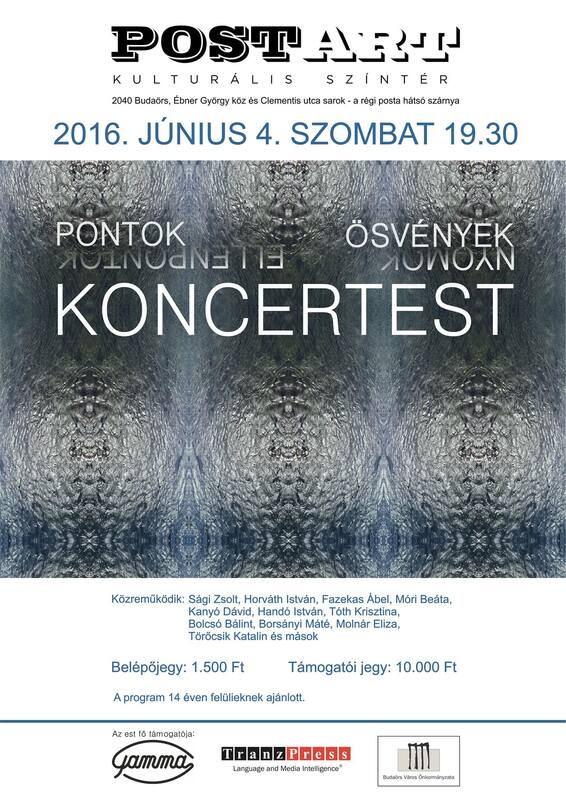 Sonatensatz will be played this time by Péter Surján (violin), Péter Tornyai (viola) and Tamás Zétényi (cello). I can’t wait to hear Nap. Futás being premiered in Brussels, along with pieces by fellow students Alex Glyde-Bates and Ben Jameson. Date, location: Tuesday, 11-03-2014, 20:30, Q-O2 workspace for experimental music and sound art, Brussels. Pieces on the matter of durations. A Feldman-opus from 1961 (Durations III) in the centre of the programme. Date, location: Friday, 08-11-2013, 13:00, Turner Sims Concert Hall, Southampton. Event of the year: the members of The DeClassified (info) premiered my clarinet quintet entitled Topographical Poetry on a concert of the festival held in Iceland. Besides two other pieces were played in the same programme by composers Ellis Ludwig-Leone and Árni Freyr Gunnarsson. The recording of my piece will soon be available here. Date, location: Ísafjörđur, from 18th to 24th June 2012, Ísafjörđur, Iceland. Date, location: 17-05-2012, 18:00, Zoltán Kodály Secondary School, Debrecen, Vár utca 1. Me and Valéria Szilágyi are going to play my piece for two pianos written in 2006. Hungarian premiere! Works by Samu Gryllus, Máté Szigeti, Péter Tornyai, Karlheinz Stockhausen, Franco Donatoni and some Soundpainting at the end. After the 2012 premiere my THReNSeMBle Piece will be played again! 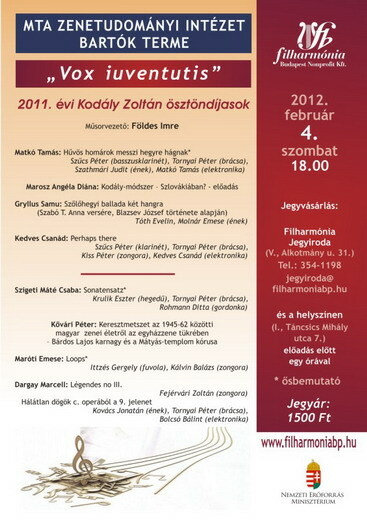 My piece Trio (5), first performed on Bartók Festival, Szombathely in 2011, will be played second time in this concert. My stringtrio, Sonatensatz will be played on this event. My piece, Fall (for clarinet solo) will be premiered on this concert. Among many composers’ duos for harp and percussion, my piece for Duo Harpverk will be performed by Katie Buckley and Frank Aarnink.